Companionship services involve having an aide or a caregiver who can stay with your loved one at home while the rest of the family go to work, school or run errands. This ensures that your loved one is kept company by a professional. A companion can provide bed-side care, assist with mobility, join your loved one with recreational activities, and most of all, respond to emergencies if one occurs while you’re away. 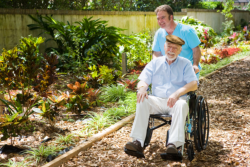 Companionship services not only put your elderly parent or disabled loved one in capable hands; it also gives you the peace of mind that a professional is in your home keeping your loved one safe and healthy.